Ladies, it has been a long week. 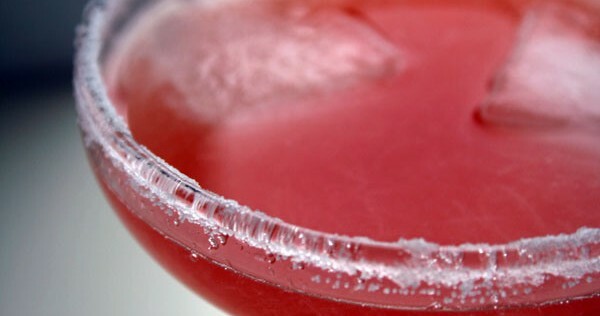 However, there are not many weeks that this spicy sweet margarita COTM (cocktail of the moment) can’t improve upon. It is like a Spanish fiesta dancing upon your palate with each sip. If you’re ready to start celebrating the weekend, these are the ingredients you will need to do it right. Make sure that you start the process at least an hour and a half before you plan on enjoying it, as it will involve some heat up and cool down time. The first thing you are going to need to do is make the rhubarb syrup. To do this, add the two stalks of rhubarb, 2 tablespoons honey, 1/4 cup sugar, and 1/4 cup of water to a pot and simmer over low heat for 10 minutes, or until the rhubarb is soft. Let cool for five minutes, then blend in a food processor or blender until smooth. Set aside until the syrup cools, and place into the refrigerator to chill. When the syrup has chilled, take out four margarita glasses and add some sea salt to the rims (optional) and set them aside. Measure 1 1/3 cup of the chilled rhubarb syrup, and pour it back into the blender, and add the remaining ingredients. This will include 2/3 cup fresh squeezed lime juice, 2 teaspoons of chopped rosemary, 1/2 teaspoon of chili powder, 1/2 cup tequila, and 1 cup of ice. Pour the resulting spicy rosemary rhubarb margarita mix into the four glasses (or one glass if you have had a particularly tough week), and garnish with a slice of rhubarb and a sprig of rosemary. The rest of the party is up to you.